IRMA-17 is a category 5 tropical cyclone currently moving forward in the Caribbean to the northwest. 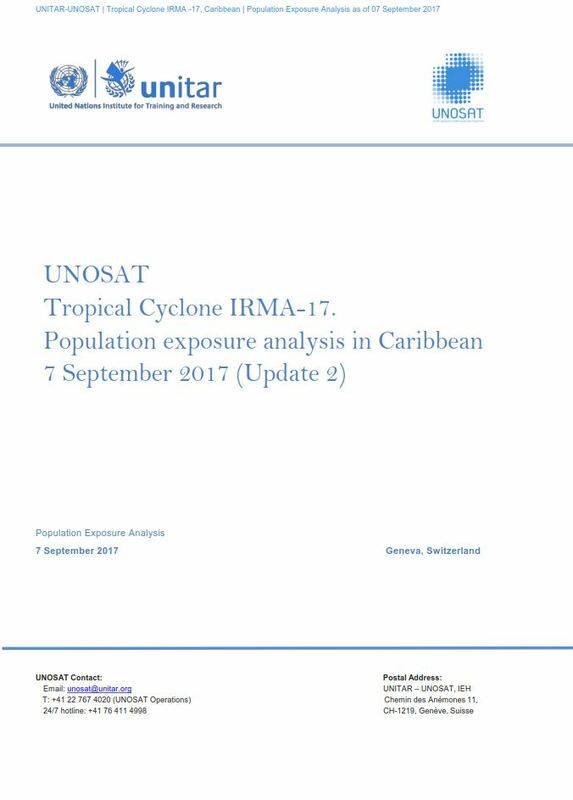 Since 06 September 2017 at 00h00UTC, IRMA-17 has been hitting several Caribbean islands such as Antigua and Barbuda, Anguilla, St Kitts and Nevis, The British Virgin Islands and Puerto Rico, all of them located in the 120km/h wind speed zone. As of 7 September 2017, IRMA has maximum sustained winds of 296 km/h and is expected to hit more islands in the following hours, such as Turks and Caicos and The Bahamas, before moving north towards the state of Florida in the United States. Based on data of the predicted tropical cyclone path, wind speeds from JRC (Warning 33 issued on 7 September 2017 at 09:00 UTC), and population data from WorldPop, UNITAR-UNOSAT conducted a population exposure analysis for the Caribbean, where nearly 2 Million people are living within 120km/h wind speed zone and more than 10 million people are living within wind speed zone of 90 km/h.